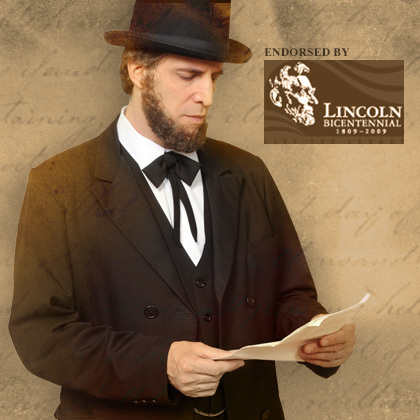 In this 45 minute interactive dramatic program, actor-storyteller Lou Del Bianco portrays Lincoln as Civil War President, frontiersman and storyteller. Lincoln’s values… honesty, love of family, thirst for education, sense of justice and perseverance shine through this dynamic new presentation. Authentic historical quotations are used throughout; handout available for teachers. Appropriate for all ages! Programs for grades preK-2, 3-5 and 6-8. Study guide available. • Start of the year kick-off in Sept.
• Grace Bedell Letter to Abe in Oct.
• Election day / Gettysburg Address in Nov.
• Black History Month in Jan. • Presidents Week in Feb.
or any time of year!